With the PyeongChang Winter Olympics set to open in just over a month (note the bobsled in the accompanying graphic!) it is highly appropriate that my first post of 2018 deals with Korea's continued network-centric approach to digital development. The network centric approach is nothing new for South Korea having originated with the start of the digital era in Korea way back in 1980-81. For those readers interested in more detail,my article entitled "Network Centric Digital Development in Korea: Origins, Growth and Prospects?" was published recently by Telecommunications Policy as part of a special edition for the 40th anniversary of the journal. It should be downloadable free of charge for another week or two at this link, courtesy of the journal. The emphasis on building fast, state of the art networks as a core element of Korea's ICT sector policy shows no signs of abating any time soon. As reported by The Korea Bizwire and other local press, the Korean government and industry are planning major investments in 5G network infrastructure in 2018, on the order of $9 billion. This should come a no surprise given the following realities. 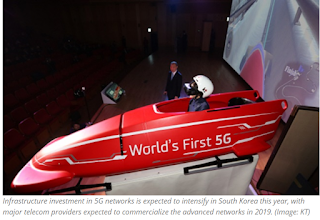 KT, the official communications provider for the PyeongChang Olympics has promised, from the start, to provide a "5G Olympics," as discussed in this post. The broader political, economic and technological significance of the Olympics to Korea was a subject of many posts over recent years. Korea's commitment to building 5G infrastructure coincides with a similar government policy to build the world's first nationwide public safety LTE networks, a topic also discussed in several earlier posts. Consequently, it was no coincidence that Korea chose to build the first phase of its public safety networks in PyeongChang, to meet both the networking demands of the Olympic games and the requirements of PS-LTE networks while taking advantage of the Olympics as a showcase for the world to see Korea's network technology in action. The ITU is scheduled to make a final decision on global standards for 5G networks in 2020. Korean companies have been active with international partners and standards organizations. As noted in The Korea Times last September have "bet big on 5G global standards."